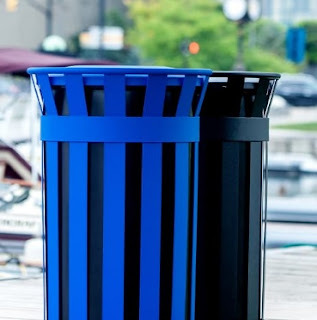 Waste Can / Trash Can / Without them we would be in big trouble! 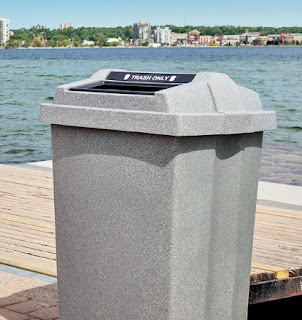 Of course you don't think about a trash can when you're using one or when you walk past one in a park- but if you think about it when you don't have a trash can you might be tempted to litter. That's a bad thing and we know that. Sometimes it is difficult to remember that not all thing are recyclable and which ones are but with a detailed and organized waste system that is easily labeled and displayed you won't have to worry about that any more! "Americans' generate trash at the rate of four pounds per day per person. This translates to a staggering 600,000 tons per day and 210 million tons per year; which is almost twice as much per person as most other countries." We have to do something about this as a whole and it takes effort. 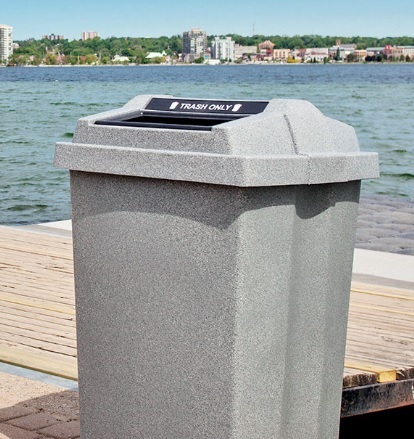 This is why we thought adding waste cans to our catalog was not only important but also socially conscientious for us to be eco-friendly and about recycling and conservation. Trash can take anywhere from 10-1000 years to decompose; most plastics that it and in the idea that waste gets dumped in the ocean and or just keeps piling up as well as smells bad, we as humans who created this evil need have to be more involved in the making, using, disposing, and recycling of each item we purchase and throw away. A circular economy is the goal: everything that is made does not have to be throw away. It can have a life to get repaired numerous times and if an item is not recyclable the consumer can return it to the manufacturer and they can recycle what they can and dispose of the item properly into another circular recycling system to make something completely new. "mind=blown" it does exist out there. We personally have been working with an amazing company that can not only help us with this goal to have a circular economy but also a company that has a long history of make items to help, not hurt, the environment. Busch Systems has been in business since 1981 when the owner "...has a passion for the environment and the exciting developments that were occurring in the recycling industry. Thirty years later, our commitment to the environment has only increased and out Sustainability choices and actions have become central to our values and corporate culture." Busch Systems is a company we at Conserv-A-Store are glad to partner with and make a growth in the eco friendly space for consumers to make more informed decisions. Their core philosophy is one we believe in as well. "People, Planet, Product." It's that simple. We make and sell products fro people to not hurt the planet which make a great product for the people and the planet. It has to help all three or it's no good in our eyes. Environmentally responsible products inspires others to make better purchasing power and offering education and enticing participation for a common goal. We are happy to celebrate that journey with our customers and Busch Systems. LEED, or Leadership in Energy and Environmental Design, is an internationally recognized green building certification system, developed by the US Green Building Council (USGCB). 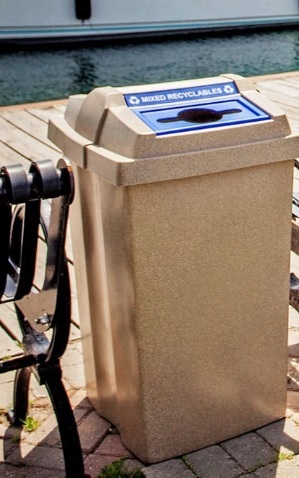 Find out how to receive LEED points via recycling and waste containers here! Busch Systems is proud to be a part of this! "Sometimes, it's better to keep it simple and sweet. Recycling and having a place for customers or general people to throw trash away is an important part of keep the Earth Clean from unwanted debris pilling up in unwanted location. Though something as a waste can is not generally classy and sophisticated; we're changing the the thought process on that. "